Tax appeals are highly complex and uncertain. 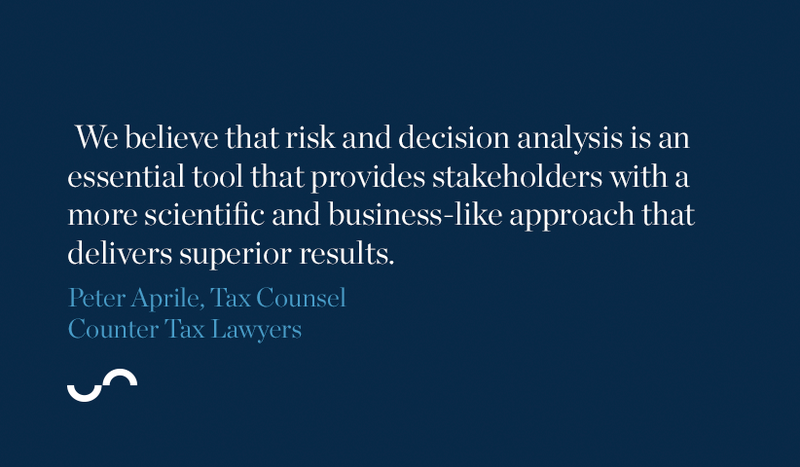 It requires tax lawyers to make decisions based on unknown information and uncertain events. It is impossible to guarantee results or eliminate risk. However, decision-analysis systems can reduce the uncertainty and significantly improve a taxpayer’s chances of success. It is surprising that most tax lawyers do not have a system to understand and analyze the alternatives, trade-offs, risks, and financial consequences. Instead, most tax lawyers rely on gut, emotion, experience-based guesswork, and seat-of-the-pants analysis. allows stakeholders to evaluate potential outcomes objectively. Simply put, R&DA makes tax lawyers more effective and offers stakeholders a competitive advantage in tax appeals. 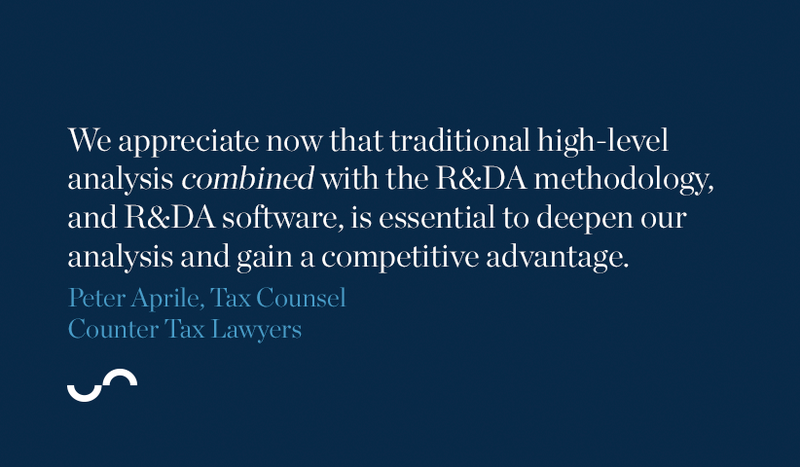 Moreover, technology and programming present an opportunity to develop specialized tax appeal R&DA software to augment further tax lawyers’ expertise, disrupt the traditional tax appeal analysis, and expand the competitive advantage that tax lawyers using R&DA now enjoy. Ron Howard and Howard Raiffa started and developed the decision analysis discipline. Howard’s and Raiffa’s research and methodology caused the discipline to spread to various fields, industries, and businesses. For example, Chevron has adopted R&DA methodology and reports that it has used R&DA to evaluate opportunities, manage risk, and guide every major decision that Chevron has made in the past 25 years. Chevron explains that “decision analysis is a part of how Chevron does business for a simple, but powerful, reason: it works”. Decision-tree analysis is a recommended R&DA tool and technique that leads to a visual model or graphical representation. It uses branches, sub-branches, and various nodes to represent decision paths, choices, and outcomes. It requires the analyst to identify and split decisions, events, and issues to a granular level, assign quantitative probabilities, and calculate financial consequences related to all potential outcomes. 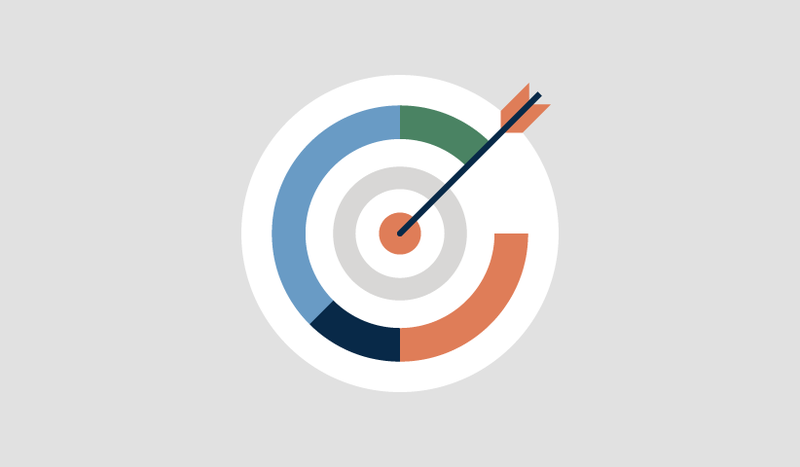 The probabilities and financial impact of paths and potential outcomes allow analysts to identify and select the strategy with the highest positive (or lowest negative) probability-weighted average. The exercise and analysis calculate the expected value and reveal the best solution relative to the stakeholders’ objectives, preferences, and constraints. Moreover, the visual model provides a structure in which all stakeholders can test the analysis and probabilities, compare upside opportunities and downside risks, explore risk tolerance, and set a specific target. To see an example of decision tree analysis in practice, which the short video below from Jeff Davis. Since Howard and Raiffa began to explain and promote decision analysis in 1964, analysts across various industries and businesses have dedicated the time to learn and apply R&DA to their work. However, the majority of lawyers do not use R&DA. In fact, we are not aware of any Canadian lawyers that use R&DA in tax appeals. Why? Howard believes that “ultimate limit to the usefulness of [decision analysis] is not something inherent in the technical aspects of it but the willingness of people to do it”. 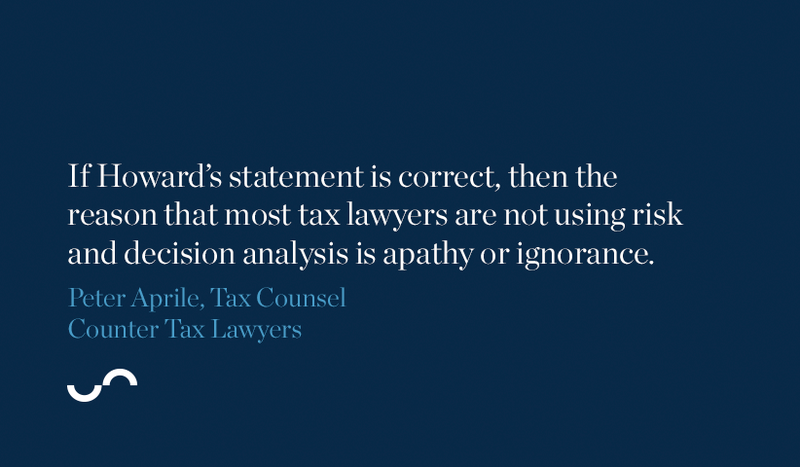 If Howard’s statement is correct, then the reason that most tax lawyers are not using R&DA is apathy or ignorance. estimate the legal fees, disbursements and GST/HST that may accrue at every stage and possible path in the appeal. The number of issue combinations, procedural paths, outcome permutations, and calculations is staggering even in simple tax appeals, e.g., 54 unique paths, calculations, and outcome permutations are common in simple tax appeals. Admittedly, the number of calculations and permutations make the compilation of complete data and inputs difficult without specialized software. However, if the tax lawyer dedicates the time to compile accurate and complete data, the effort will generate a superior analysis. In the past, we relied on our tax knowledge, experience, and intuition to value cases and develop the appropriate appeal strategy to achieve our goals (the “traditional analysis”). We have always had confidence, without boasting it, that the caliber of our firm’s work and traditional analysis was very high. Approximately four years ago, we began using R&DA in tax appeals. It has led to a fundamental change in our thinking, strategies, and goals. By comparison, traditional analysis alone seems simplistic. We appreciate now that traditional high-level analysis combined with the R&DA methodology, and R&DA software, is essential to deepen our analysis and gain a competitive advantage. It has sharpened our expertise and reinforced our efforts to conduct a more scientific analysis and business-like approach. It has made us better tax lawyers. Generally speaking, we believe that applying R&DA to tax appeals has enhanced our practice and provided our firm and clients with a competitive advantage in six ways. R&DA rejects vague goals (e.g., “beat the CRA” or “win the appeal” are simplistic and inadequate). Instead, R&DA provides all paths and generates lists of specific financial outcomes at every stage in the appeal to enable stakeholders to make decisions in the larger tax-appeal context, e.g., the appropriate settlement amounts at different stages in the tax appeal. R&DA requires that all stakeholders, at the outset, set informed and specific tax appeal targets that balance all elements, opportunities, and constraints. Also, R&DA in tax appeal produces a living analysis and strategy that guides tax lawyers and stakeholders throughout the appeal. Evaluating events and opportunities using the R&DA lens leads to studied and objective decisions and better results. It allows stakeholders to anticipate and rank various settlement outcomes and “wins” based on a careful analysis (as opposed to settlement offers hurriedly proposed or accepted based on convenience or emotion). R&DA works to ensure that stakeholders do not miss any path, choice, impact, or outcome. It highlights important (and missing) details and alternatives. It reveals paths that seem attractive but produce low ROI and unconventional paths with high ROI. Tax appeals are uncertain. No lawyer or other person can eliminate uncertainty, eliminate risk, or know the result. However, R&DA will systematically identify and simplify every element, the potential financial impact, and every best path. Identifying uncertainty and risk management allow stakeholders to address threats and build a plan to minimize or avoid the impact of the potential negative event. It is the R&DA system that allows tax lawyers to value cases more accurately through its explicit focus on uncertainty and risk, the relationships between uncertain events, and the impact on specific targeted outcomes. Quantitative terms (as opposed to imprecise qualitative judgments) promote effective communication and collaboration. Stakeholders can probe to understand uncertainties and risks. Also, the visual maps allow tax lawyers to guide stakeholders through complex information, highlight linchpin facts and issues, and draw connections with specific outcomes. The shared language and visual representation results in transparency and allows stakeholders to analyze jointly and provide input to ensure stronger arguments and the right decisions. R&DA leads to more effectively managed, and less costly, appeals. It requires that tax lawyers and other stakeholders focus on making the smartest investment (i.e., time, energy, and legal fees) that is likely to provide the highest rate of return (i.e., the greatest reduction to tax, penalties, and interest). Smart tax strategies require tax lawyers to understand with specificity the ROI that results from each path and outcome. Every choice and strategy is focused ROI and must help achieve the specifically targeted outcome to avoid misallocated resources and hollow victories. For example, a focus on ROI reminds less business-like tax lawyers that procedural motions are only appropriate where stakeholders can agree that winning the motion is an essential element to achieve the specifically targeted outcome. It is difficult to compare tax appeals and results because tax appeals are complex, unique, and nuanced. Also, it is difficult to evaluate or measure whether stakeholders won the best settlement because most tax appeals are privately settled. How can stakeholders confirm that no dollar was left behind or that clients received the best representation based on the objectives, preferences, and constraints? R&DA is a good starting point to measure tax lawyers, tax appeal outcomes, and settlement costs. R&DA’s historical record allows stakeholders to evaluate the quality of the (admittedly fluid) analysis. Were the paths, probabilities, and predictions accurate? If not, why not? Also, stakeholders can evaluate objectively and measure whether the result fell within the range of acceptable outcomes, its place on the “success continuum”, and ROI along with the reasons related to the same. 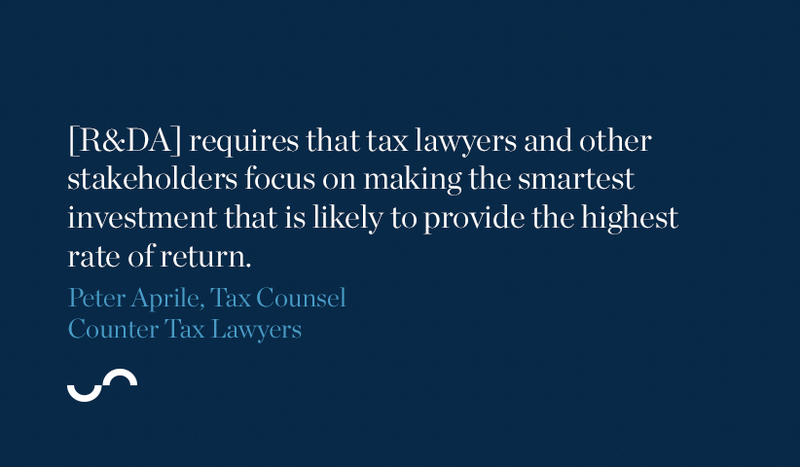 Last, R&DA’s historical record allows tax lawyers the opportunity to conduct meaningful after-action reviews to help defend against cognitive biases, and sharpen expertise to win even better results in the next tax appeal. create the space and time for lawyers to focus resources on the things that matter, i.e., exploring the legal questions, angles, options, and opportunities that will lead to optimal results. We believe that there is a real and accessible opportunity to evolve R&DA in tax appeals to gain a deeper analysis and develop more nuanced strategies. 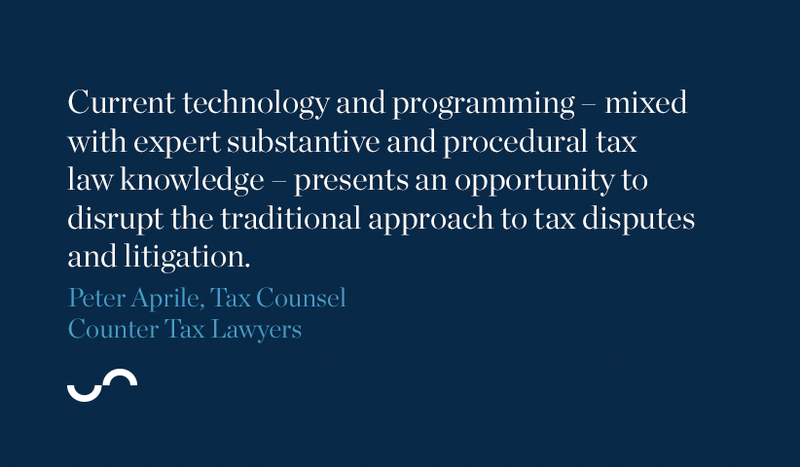 Also, emerging technology and software could further advance tax litigation and data-driven strategies. Specialized tax appeal R&DA software would augment further tax lawyers’ expertise, and it could disrupt traditional tax dispute and litigation analysis. For example, specialized tax appeal R&DA software could be combined with cognitive computing to revolutionize the way that tax lawyers quantify chances of success and set strategies. It is clear that R&DA offers a competitive advantage in tax appeals. Tax lawyers, clients, and accountants have a choice. We can continue to rely on the “gut methodology”, or evolve toward a more business-like, scientific, and effective approach. We can perpetuate traditional analysis and legacy systems, or use technology to augment further our expertise and expand the competitive advantage that we now enjoy. We can choose apathy or action. To us, the choice is clear. 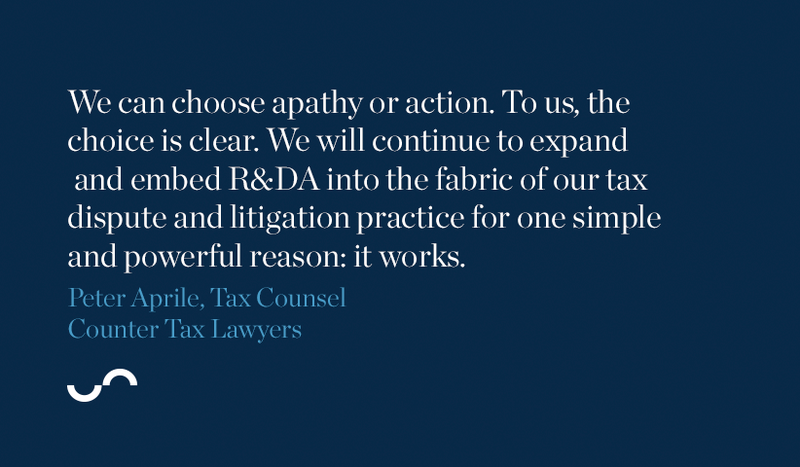 We will continue to expand and embed R&DA into the fabric of our tax dispute and litigation practice for one simple and powerful reason: it works.